Sales forecasting is the process of determining what your future sales will be and is a key element of any business plan, which you must compose if you’re starting a venture or making significant changes within an existing business. Accurate sales forecasting helps you, as a small business owner, to make better, more informed decisions. Established small-business owners can rely on figures from prior years to estimate sales. They will need to take into account sales growth expectations. 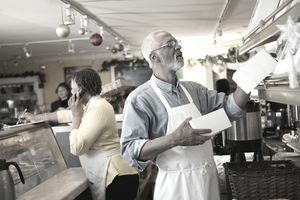 However, for new small-business owners, using sales forecasting requires studying the industry, compiling a consumer profile, and getting a sense of the competition’s sales. Sales forecasts are an inexact science, especially when you’re a new business with no previous sales figures of your own to use as a guide. If you're new, get a feel for the local marketplace by studying your target industry and talking to comparable businesses. Do the legwork to find out what people are willing to buy and at what price, and examine your competition. Check with state and federal agencies for relevant data. The state of Washington’s Department of Revenue, for example, provides retail sales statistics broken down by city. The U.S. Census Bureau provides a wealth of demographic information that may also be helpful in estimating your target market, while the U.S. Bureau of Labor Statistics provides reports on consumer expenditures. The Small Business Administration, your local chamber of commerce, and other entrepreneurial organizations may also be able to provide resources. While small businesses are rarely publicly held, you can try to research sales figures for comparable businesses through Securities and Exchange Commission filings. You will need to find out how sales are calculated for your industry. For example, psychologists and consultants are paid by billable hours, while sales forecasts for restaurants and retailers are based on sales per square foot. If you're buying a franchise, the franchisor will provide you with a uniform franchise offering circular with financial details and store listings. Talk to your franchisor about sales forecast and ask store owners in the franchise about their sales figures. Base your forecasting on your history, which will come from your accounting summaries by line of sales. This takes much of the guesswork out of the process, showing you exactly what your business has achieved in customers, units, and sales. Based on the trending you see month-to-month and year-to-year, overlay your strategies and tactics. How many more customers will you be able to attract and how often will they buy? What will the effect of investment be? How many more units will you be able to sell? What is your pricing strategy going forward? Small business owners frequently overestimate or underestimate their sales forecasts, so you’ll want to have three different sales projections: One as a best-case scenario, another as a worst-case scenario, and a third that is in between. "Revenue growth is always going to take longer than you expect. It's smart to be more conservative, to err on the side of caution in your sales projections.